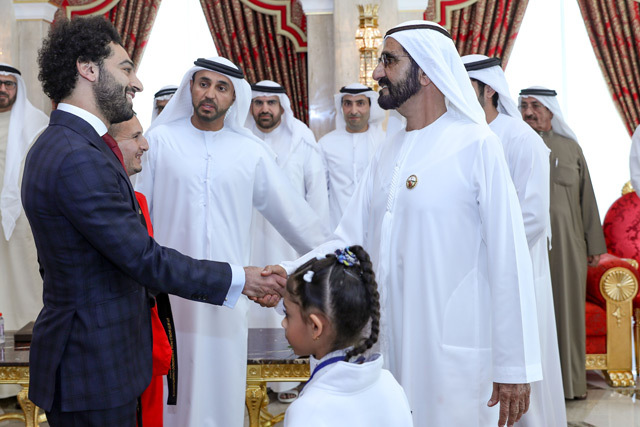 His Highness Sheikh Mohammed bin Rashid Al Maktoum, Vice President, Prime Minister and Ruler of Dubai, today received the winners of the "10th Mohammed bin Rashid Al Maktoum Award for Sports Innovation," in his palace in Zaabeel. The award’s winners later saluted His Highness Sheikh Mohammed bin Rashid on the occasion of their honouring, during a ceremony organised by the Dubai Sports Council at the Dubai World Trade Centre. His Highness Sheikh Mohammed welcomed the winners of the award, which carries his name and was founded in 2007, upon the directives of H.H. 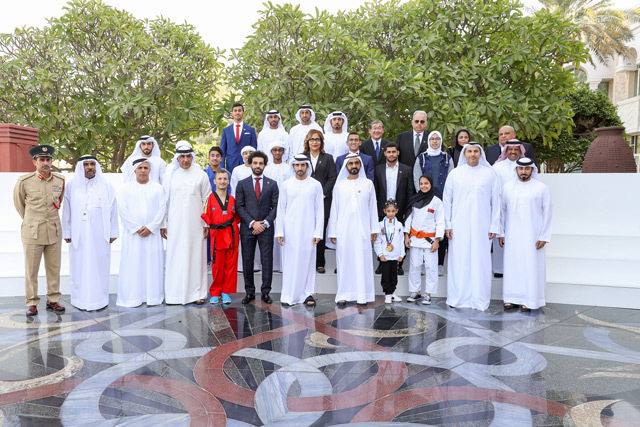 Sheikh Hamdan bin Mohammed bin Rashid Al Maktoum, Crown Prince of Dubai and Chairman of Dubai Executive Council, to promote sports in the Arab region, in the presence of Sheikh Hamdan and H.H. Sheikh Maktoum bin Mohammed bin Rashid Al Maktoum, Deputy Ruler of Dubai. H.H. 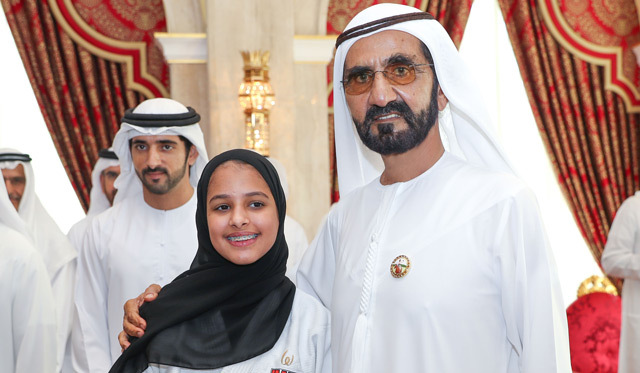 Sheikh Mohammed congratulated the local and Arab athletes who won the award and urged them to accomplish further sporting achievements on local, regional and international levels, and to be role models for promising young athletes. 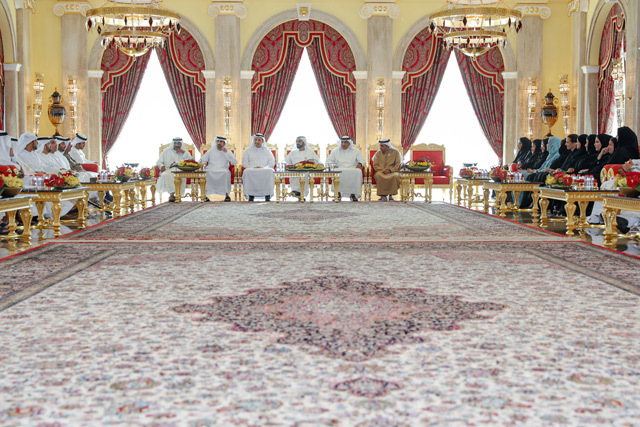 Souvenir photos were taken with Sheikh Mohammed, Sheikh Hamdan and Sheikh Maktoum to commemorate the occasion. Among those who attended were H.H. Sheikh Ahmed bin Saeed Al Maktoum, Chairman of Dubai Civil Aviation Authority and Chairman and Chief Executive of Emirates Airline and Group; H.H. Sheikh Ahmed bin Mohammed bin Rashid Al Maktoum, Chairman of Mohammed bin Rashid Al Maktoum Knowledge Foundation; H.H. Mansour bin Mohammed bin Rashid Al Maktoum; H.H. Sheikh Hasher bin Maktoum bin Juma Al Maktoum, Director-General of Dubai Information Department; Khaldoon Khalifa Al Mubarak, Chairman of Abu Dhabi Executive Affairs Authority, EAA; and other officials.